Ships today if you order in the next 1 hours 42 minutes. 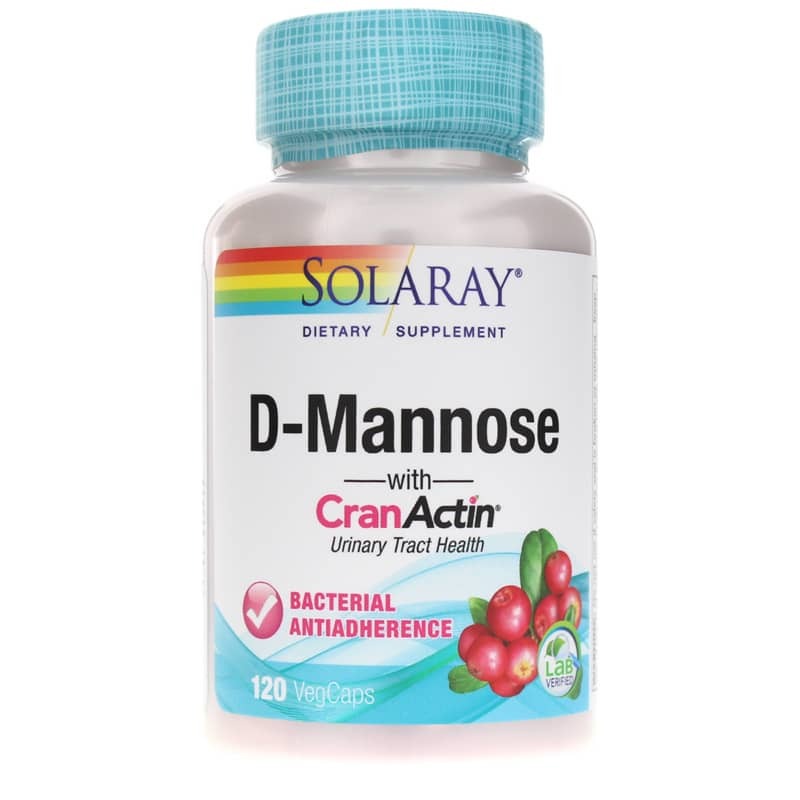 D-Mannose with CranActin from Solaray is a natural urinary tract support supplement containing D-Mannose, CranActin cranberry extract and vitamin C.
Many people are familiar with drinking cranberry juice to support urinary health. Unfortunately juices may contain too much fructose or added ingredients that may exacerbate uncomfortable urinary tract symptoms. D-mannose is a type of sugar that is not typically absorbed by the bloodstream, which may assist the body in maintaining healthy bacterial balance throughout the urinary tract. CranActin Cranberry AF is a proprietary cranberry extract which has been designed to enhance cranberry's natural bacterial anti-adherence properties. Adults may take: 2 capsules per day, with a meal or a glass of water, or as directed by a healthcare professional. 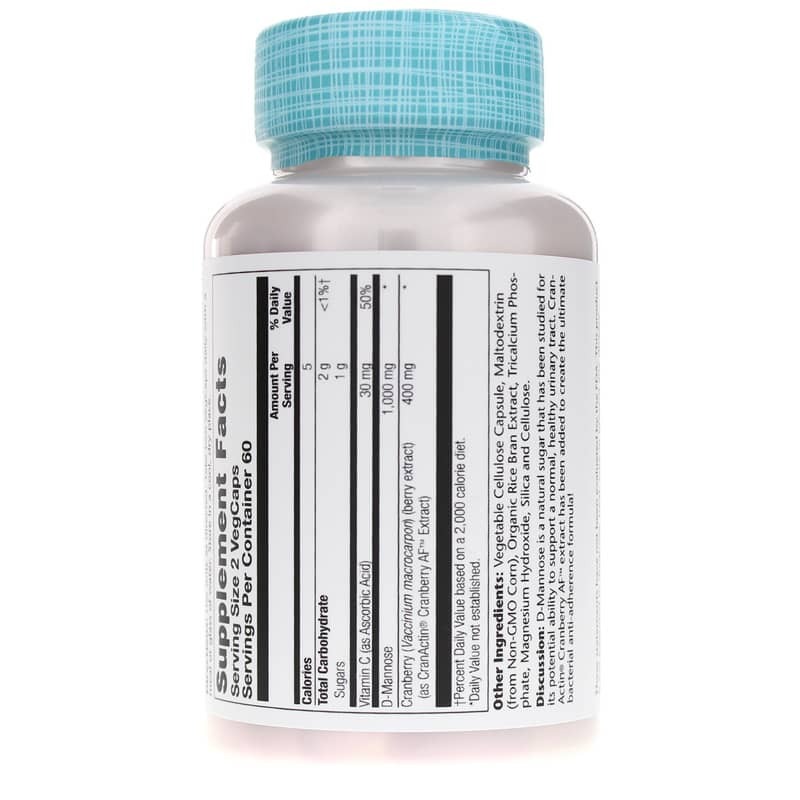 Other Ingredients: vegetable cellulose capsule, maltodextrin (from Non-GMO corn), organic rice bran extract, tricalcium phosphate, magnesium hydroxide, silica and cellulose. Adults: Use only as directed. Take two VegCaps daily with a meal or glass of water. Store in a cool, dry place. These D-Mannose with CranActin, 120 Vcaps, Solaray capsules work quite well. 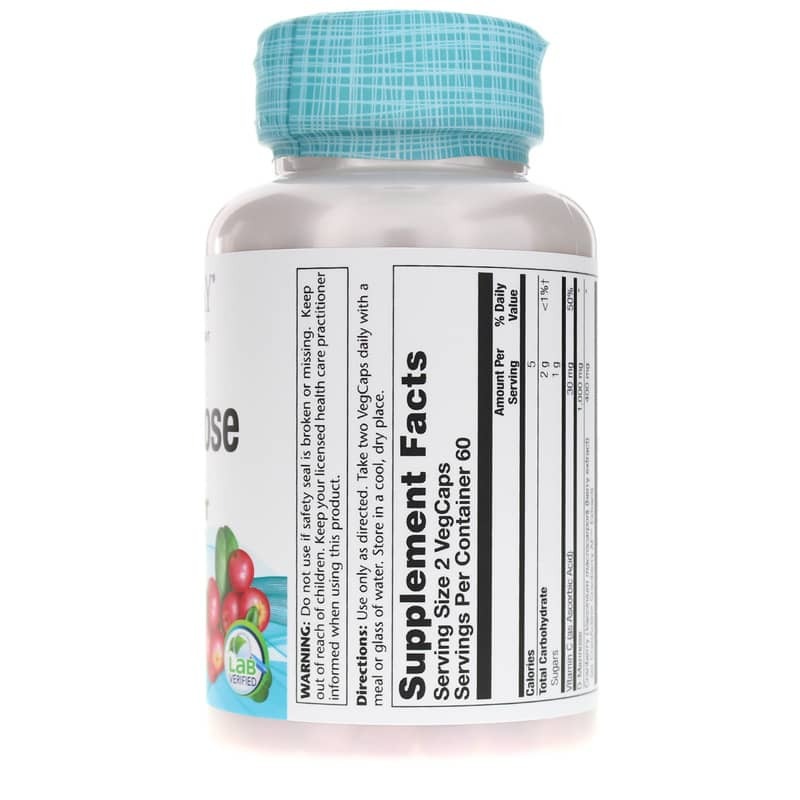 I take 2 per day in the morning with cranberry juice (unsweetened) and with food. I then take 1 plain cranberry extract capsule 500mg after supper. It's the only thing that gives me hope. So far so good! Best price for the CranActin 120 Vcaps I've come across. Keep the price low and you'll keep me as a customer!!! Huge improvement since being put D Mannose on 2/day. I was purchasing the 60 count bottle elsewhere for more than this company sells the 120 count!!! Great savings for a great product. I have used D-Mannose with CranActin for several years.This was a great price for 120 pills and the service I received was excellent. Will purchase from you again. D-Mannose with CranActin was recommended after trying many other products. I've been using it faithfully each morning since 3/2013. It really works! And much cheaper ordering through this website. If you want good results, try this product. This was my second purchase from this vendor and I will continue to buy from them! My Mother has not had a Urinary Tract Infection since she started taking D-Mannose with CranActin by Soloray. Ever since I take two capsules of D-Mannose, one in the morning, one at night, I no longer get any urinary tract infections. I am delighted that I discovered D-Mannose! I have been taking these tablets for quite a while now. I was told the ingredients would help prevent U.T.I.'s. I normally order them from this company because the price is good and I receive them in a short amount of time. This help me with UTI because my Blatter does not empty completely. It Coat the inside of your bladder and flushes out all bacteria that was that in your bladder. This was Recommended to me by my urologist two capsules in the morning it works very well. It is a Sugar product. I used to have to take those OTC pills when I felt a UTI coming on. Sometimes it helped--sometimes I still had to get an antibiotic. Since I started taking D-Mannose daily, I haven't had any issues with a UTI. I recommend them, I'm in my 60s and used to get UTIs often. My doctor recommended this product. I bought some locally and paid double what I got it for on line. My order was processed promptly and I received it within a few days. D'Mannose is the greatest! It really works! It has saved me many trips to the doctor since using it faithfully!